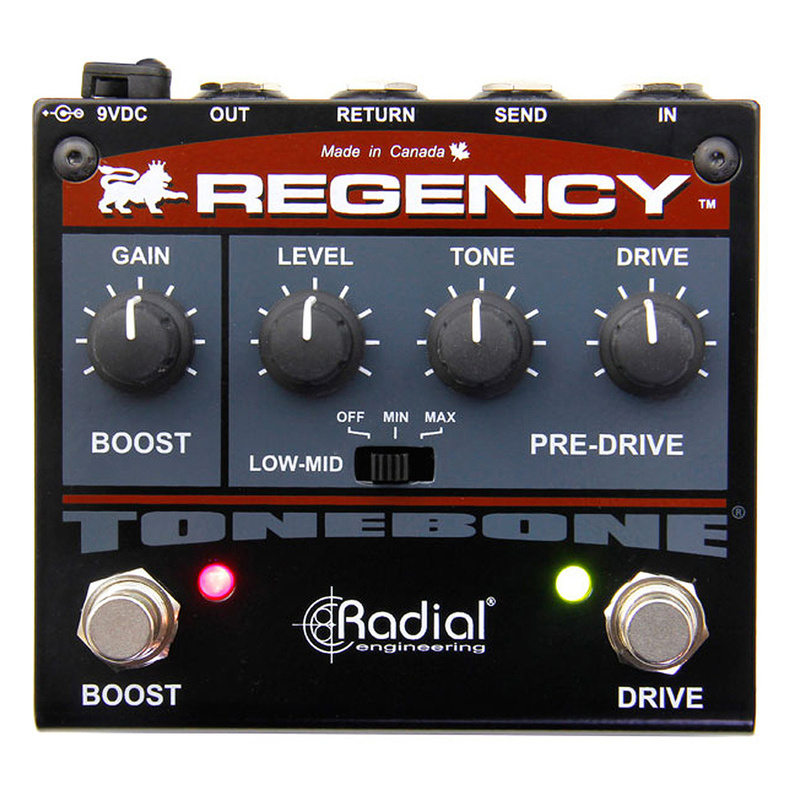 Rather than offer a straightforward overdrive pedal — Radial make a good many of those in all kinds of flavours within their ToneBone range — the Regency Pre-Drive combines a clean signal level booster with a separate, more restrained drive section. Using class-A circuitry, the booster can add up to 23dB of gain and has its own footswitch and status LED. The Pre-Drive section, which has controls for Level, Tone and Drive as well as a three-way low-mid voicing switch, also has its own footswitch and status LED. This section does add some distortion and sustain but is actually intended to be used to ‘push’ an amp that’s already adding its own distortion, rather than doing all the heavy lifting on its own. It’s ideal for adding a bit more grunt for solos and has enough drive range to pick up the slack when needed. And of course you can use both sections together, to really drive the amp’s front end. As I’d expect of Radial pedals, the Regency Pre-Drive is very robust and quite heavy, being fabricated from folded steel panels. It requires external 9V power, and in addition to the expected input and output jacks, there are two further jacks that function as an effects loop, activated when the boost section is turned on and bypassed when the boost is off. Internally the signal switching is accomplished using gold-contact sealed relays. 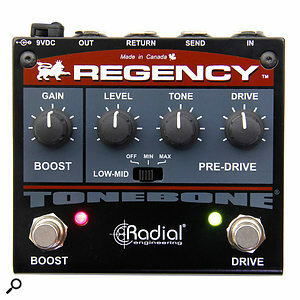 The sound you get when using this pedal will depend very much on your amp and how it’s set up, as the end result is very much a symbiosis of amplifier and pedal. However, being able to voice the drive section adds a great deal of flexibility and has a significant effect on how your amp reacts when it is contributing its own distortion. It comes as no surprise at all to me that Radial have produced yet another pedal that does exactly what they claim, and does so with a lot of style and finesse. They pay great attention both to their circuitry and their metal enclosures: like their other pedals, this one delivers quality sound and is built to last.